We had just stopped to see the waterfalls of Madeira when appetite struck. 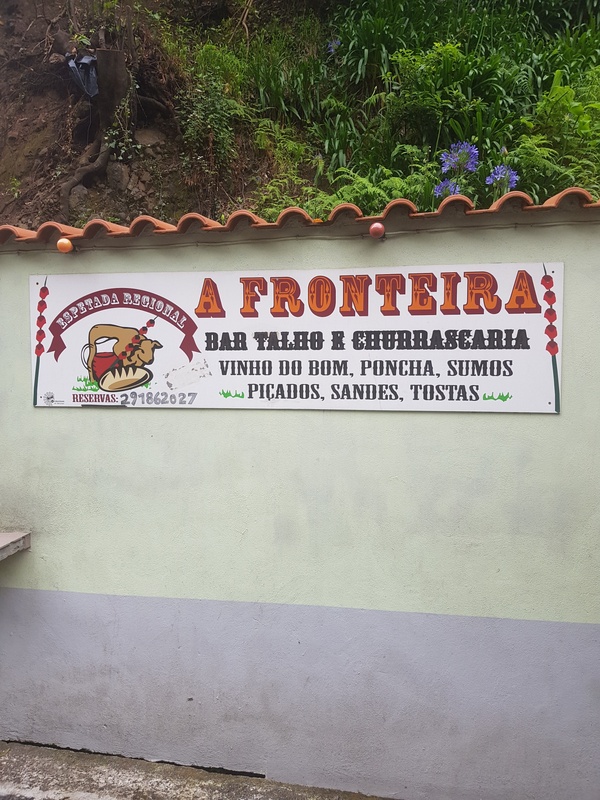 All that oxygen-rich air spilling in from the dense green plant growth and flowing out of the Atlantic Ocean had made us hungry like wolves, and the bowl of peanuts with the granadilla rum punch back in Funchal was not helping. 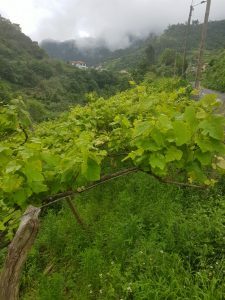 The waterfalls were on the road between Funchal, the hill-hugging capital and Santana where the vines grow within spraying distance of the sea. And having done the obligatory camerawork, my travelling amigo Joaquim Sá and I hit a pass curving through a valley lined with vines and eucalyptus trees and banana plants and a whole botany book full of lush leaves, bright flowers and moist ferns. The smoke was visible from a mile off. And we were heading in that direction. I briefly thought of active volcanoes, ferociously burning car wrecks or weed-inhaling Jamaican toboggan racers, but it all it was was a guy grilling some meat outdoors. It was a place called A Fronteira, and it stands alone in the emerald-coloured valley filled with the sounds of birds and breathing plants. 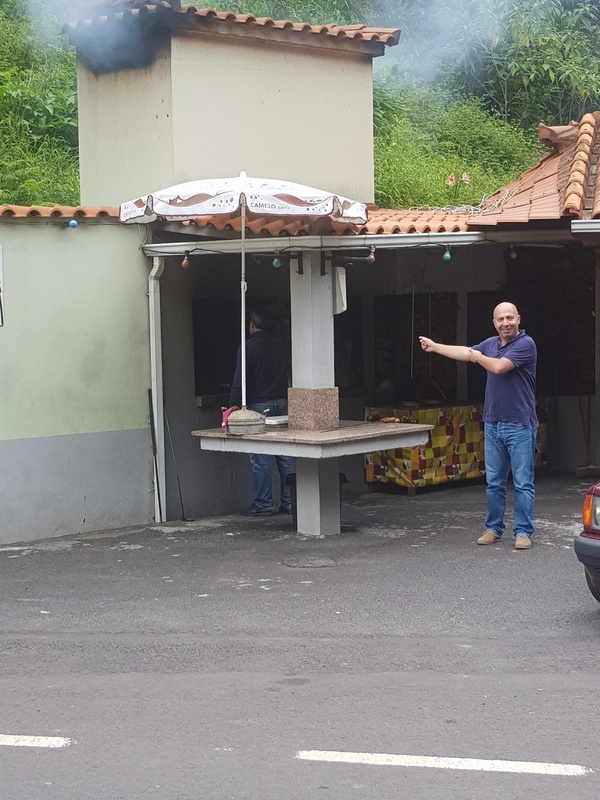 And it is the best eating joint one can ever hope to find at the end of the earth, which this island of Madeira feels like. 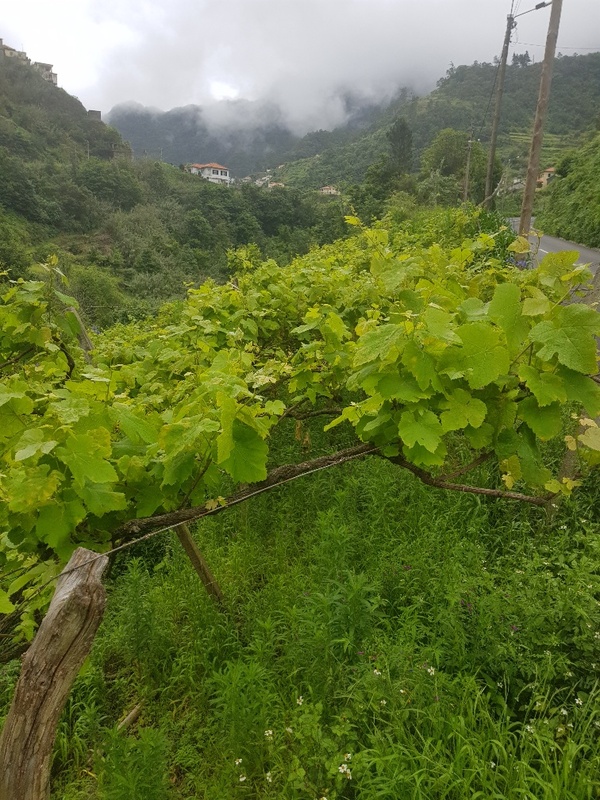 Vines in the valleys of Madeira. Having procured a table on the porch and ordered some beers, Joaquim and I headed out to where the meat was being fired. An energetic middle-aged guy with a spring in his step and wine in his voice was going about his business of cooking espetada, the inverted skewer of grilled meat familiar to anyone who visits eateries claiming Portuguese heritage. The fire was outside next to the porch and we had a great view. Metal skewers the length of some Game of Thrones weaponry and filled with red meat and pieces of chicken were cooking on a flaming wood fire. The aroma was intoxicating, and the sound of sizzling fat meeting fire and that fragrant smoke was a godsend to two guys who had only pecked at some peanuts since morning and had a good Madeira rum buzz going. We ordered, but had to wait in line. 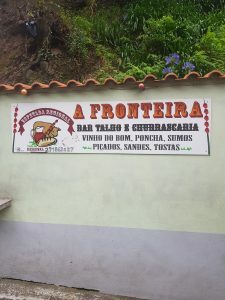 A Fronteira was full of lunch-time diners, families mostly, and each table was carrying – or waiting to carry – the espetada display of meat. Senhor the griller explained the process as he made our espetada before our eyes. Beef comes from Madeira – authenticity is a thing here – and is cut into neat cubes. I recognised some fore-quarter and rump, with a bit of fatty neck thrown in. The meat looked fresh, unhung and good. 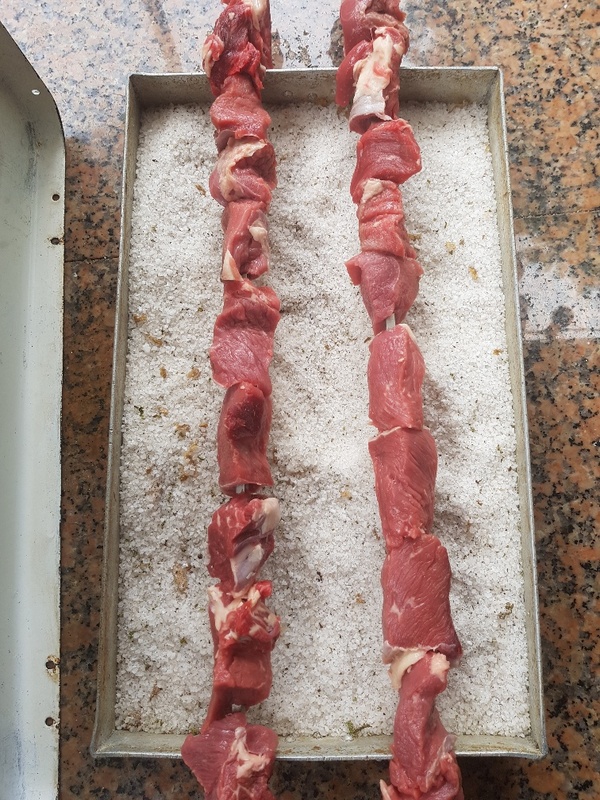 After being skewered onto the espetada spike, the meat gets dabbed with crystal white rock salt that has been allowed to draw some flavour from a couple of fresh bay-leaves. The salt is not applied as liberally as I’d thought, but once the skewer gets placed on the fire – low and direct – the burning seasoning starts making gun-like cracking sounds and almost immediately puts a gorgeous crust on the meat. We were not given many options as to how the deal should be done, but ten minutes of fire makes it medium on Madeira, which is pretty much medium-rare in other countries. As we waited for the cooking, a business-like waitress brought bread and wine, as well as a spectacular fresh salad of tomato slices the size of small Frisbees and crispy lettuce leaves. The wine was local, from the American rootstock. Joaquim, the discerning palate in the twosome, was not impressed and stuck to Coral beer. I found the wine fruit-driven, with lashings of Ribena-like berries and a controversially tight finish. I slid a chunk of hot beef from the skewer and cut it in half. It was perfectly cooked, a rivulet of warmed blood and fat flowing onto the plate. To the bite, the meat was firm, giving away completely once chewing began. The juices burst into the mouth, the taste of perfectly fire-grilled beef lit up the valley and even the rough American rootstock vino was beginning to taste like old Burgundy stolen from and dank cellar filled with cobwebs. It was one espetada, but it was a lot of beef for two guys, especially once the bloody, juice-soaked bread and those absolutely gorgeous chips had made their presence known. But we ate and talked, and chirped with the griller who kept feeding the fire with wood, and cooking this espetadas which he knows he does better than anyone in the valley. The sun had parked behind a wall of clouds, and the sounds of birdsong had fallen silent, and all I noticed was how alone we all were. Well-fed, but alone between steep high hills and thick, jungle-like green plant-life with only that snaking piece of tar road to take you out of here. It’s a place you’re bound to leave, but for now you’re going to stay. Just a little bit longer. Sounds awesome Emile. Joaquim is not the worst guy to travel with. Madeira definitely on my bucket list! You will not be disappointed. Amazing place. Net soos ek hom ook ken (die espetada bedoel ek). 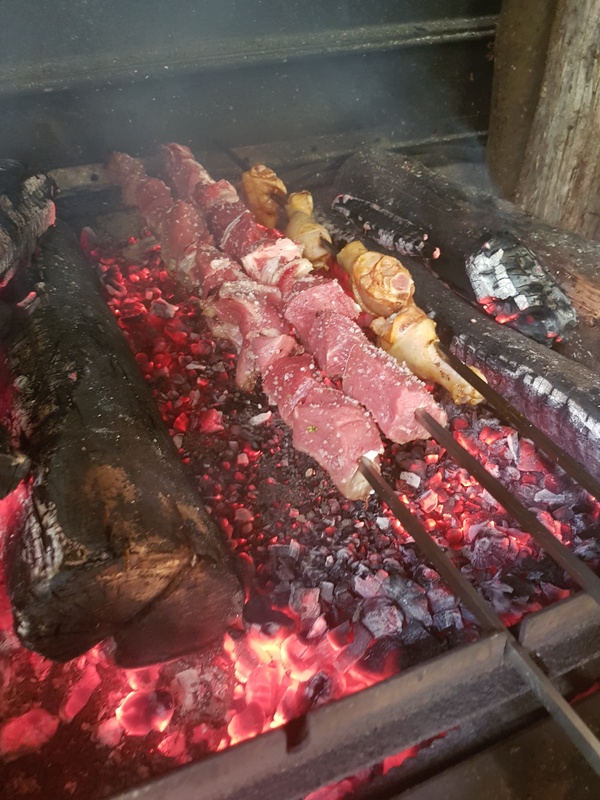 Daar in die Paarl is ‘n Madeira gebore vakman wat die skewers maak.